Allison Druin has been elected to the SIGCHI Academy. The SIGCHI Academy recognizes individuals’ substantial contributions to and leadership in the field of human-computer interaction. As a researcher, Druin has been a longtime advocate for children as partners in the design of technology. Along with her inter-generational design group Kidsteam, Druin has done groundbreaking work developing collaborative design methods. Kidsteam has contributed to the design of such projects as the International Children’s Digital Library, and the website for the National Park Service initiative Every Kid in a Park. As a leader in the field, Druin is presently the Co-Director of the Future of Information Alliance, and has served as Director of the Human-Computer Interaction Lab, and Chief Futurist for the University of Maryland’s Division of Research. 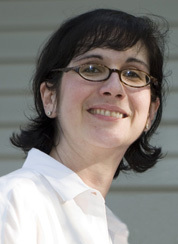 In 1996, she established CHIkids, a SIGCHI program that involved children as conference reporters, software testers, and digital storytellers. She is also the conference co-chair for CHI2016. Druin is a Professor in the University of Maryland’s College of Information Science, and currently serves as a Special Advisor for National Digital Strategy for the National Park Service. She was previously honored by SIGCHI with the Social Impact Award in 2010 and was named a Distinguished Scientist in 2014.